A Soyuz launcher rocketed into orbit from northern Russia Saturday with a lighter, more capable Glonass navigation payload for the Russian government, resuming a modernization initiative to improve the country's positioning satellite fleet after a rocket mishap destroyed three spacecraft in December. The Soyuz 2-1b rocket blasted off at 0307 GMT Saturday (10:07 p.m. EST Friday) from the Plesetsk Cosmodrome, a military-controlled space base just south of the Arctic Circle in the far northern part of Russia. The rocket's three main stages finished their job about 9 minutes later, yielding to a restartable Fregat upper stage to complete the mission. The hydrazine-fueled Fregat stage reached the planned orbit at 0641 GMT (1:41 a.m. EST) and released the 2,060-pound satellite, according to Roscosmos, the Russian space agency. A Russian defense official told the Interfax news agency ground teams were communicating with the spacecraft, which was working as expected. The launch was delayed two days by a technical issue. 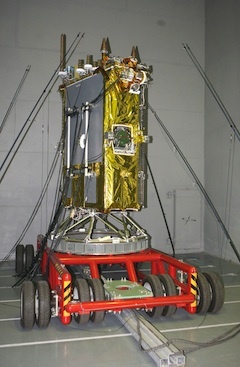 The craft is the first Glonass K satellite to be launched. The next-generation satellite is smaller than earlier platforms, will transmit more navigation signals and has a longer design life. The Glonass K satellite is expected to operate for 10 years and features five navigation channels, including a new civilian L-band signal. In an improvement over earlier Glonass satellites, the new craft are lighter and based on an unpressurized bus built by ISS Reshetnev. Unlike previous Glonass M satellites, which launch three at a time on Proton rockets from Kazakhstan, the new generation of navigation spacecraft will blast off on Soyuz boosters from Russia's northern space center. Future Soyuz flights could launch two Glonass satellites in one mission. The Soyuz launch was the first flight of fresh Glonass satellites since a Proton rocket failure destroyed three payloads in December. Launch technicians overfilled the the Proton's Block DM upper stage with propellant, making the vehicle heavier than expected. The Proton's third stage was unable to place the more massive Block DM on the proper trajectory, causing it to crash back to Earth in the Pacific Ocean. Another trio of Glonass satellites will blast off on a Proton rocket later this year. Glonass satellites fly nearly 12,000 miles above Earth in orbits inclined about 65 degrees to the equator. Scattered in three orbital groups, the Glonass constellation currently includes 22 operational satellites, plus four more in maintenance, according a Russian space agency website. The fleet requires 24 operational satellites to achieve global navigation service. Russian officials hope the Glonass constellation will provide worldwide positioning data by the end of 2011.